My girl Jasmine just turned 26... 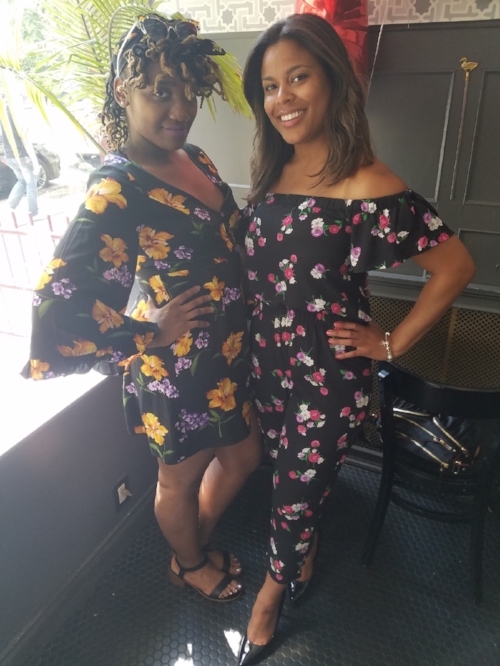 So we celebrated with a boozy birthday brunch at Peque Vinos + Tapas, over in Harlem. Then, we made our way over to Hudson Terrace for a rooftop party. The steak + eggs and the chicken + waffle were the two most popular menu choices. And boy was it good! Not to mention we had bottomless mimosas and the cocktails were fab. I took the bartender's recommendation and went with a Rum Runner. Jasmine created her invitation on Evites. I'm noticing that more of my friends are using Evites, which is not so typical of millenials. I personally love digital invites because I adore decorative invitations and feel better about saving paper. There are so many fun, animated evites you could send. Why not save the money for more booze at your party? Gold number balloons are definitely a huge trend right now, in terms of party decor. Party City has a huge selection and they even blow them up same day. And now they come in different metallic shades, so you can dress up your event in silver or rose gold too. The Paper Source also sells these fancy metallic number balloons, with little tassels that hang from the bottom. Summer style... floral prints, rompers, and jumpsuits. Speaking of trends... black jumpers are certainly making a come back. They're a comfy outfit for any occasion because they can be dressed up or down. And floral prints are always great for Summer and Spring. Btw it was a toal conicdenec that Imari and I were twinning at the brunch.